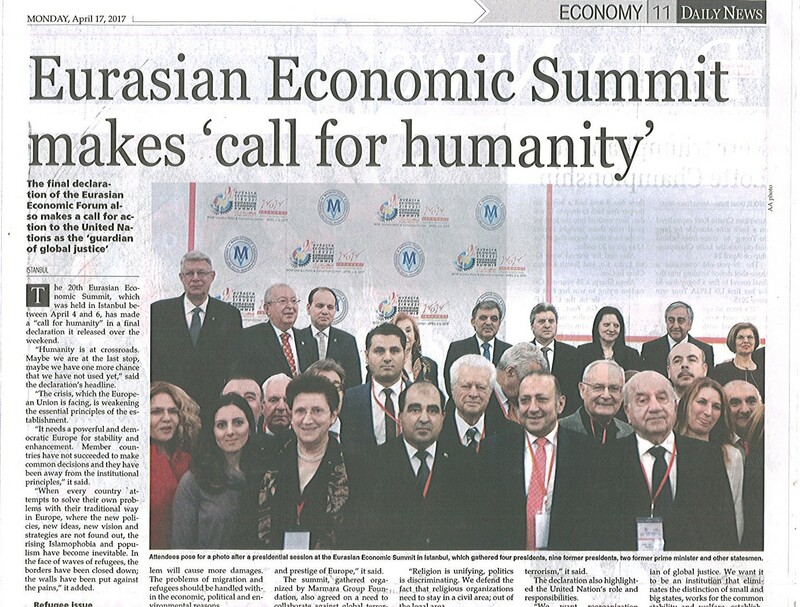 The Final Communiqué which reflects the common opinions of the participants, was published with the title of “A call for Humanity" after the 20th Eurasian Economic Summit. 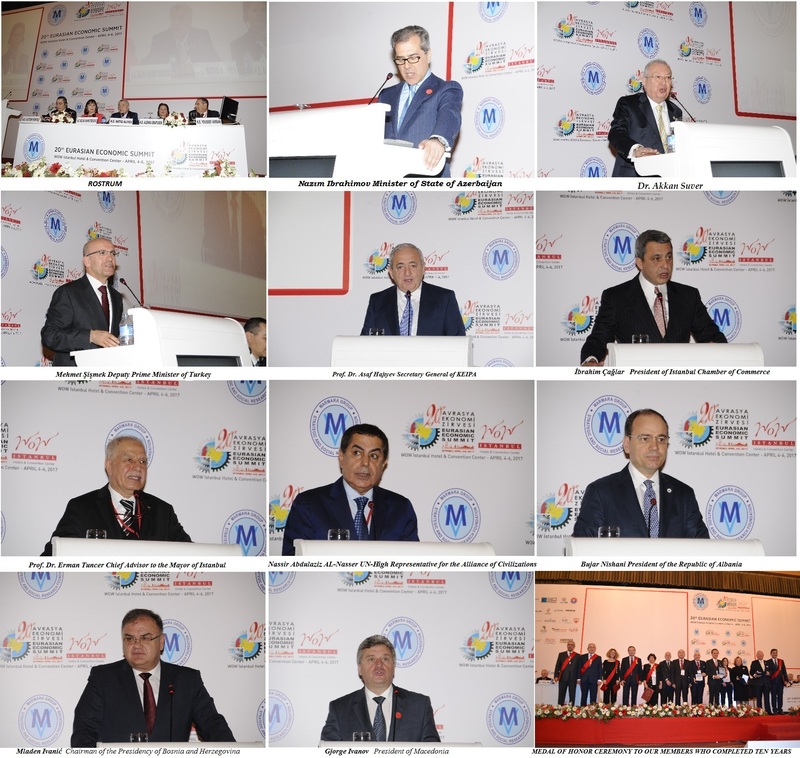 In the 20th Eurasian Economic Summit, which was held on April 4-6, 2017 in Istanbul, Turkey was represented by H.E. Abdullah Gül - the 11th President, H.E. Mehmet Şimşek - the Deputy Prime Minister, H.E. 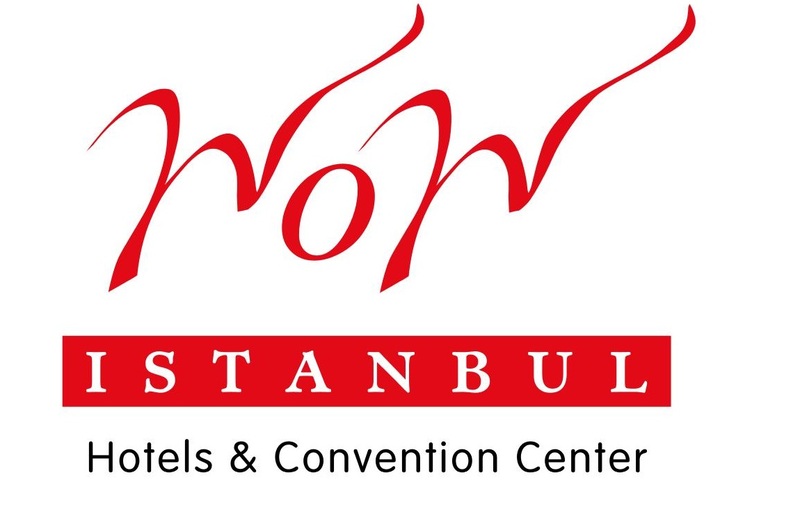 Vasip Şahin, the Governor of Istanbul; the Republic of Albania was represented by H.E. Bujar Nishani, the President, the Republic of Macedonia by H.E. 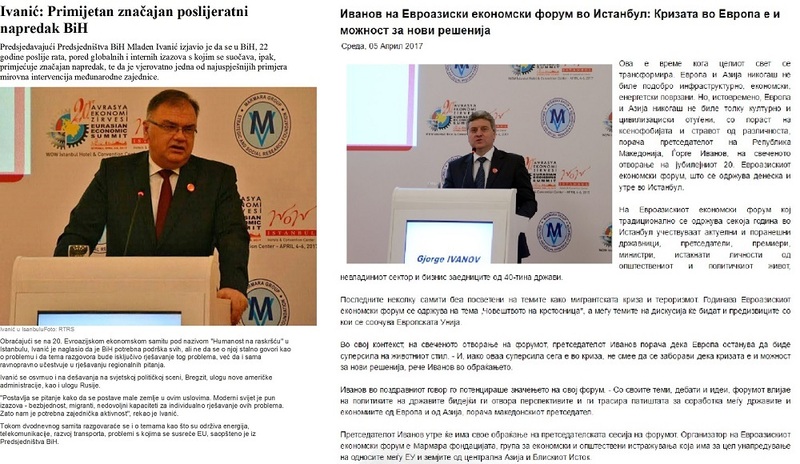 Gjorge Ivanov, the President, Bosnia and Herzegovina by H.E. 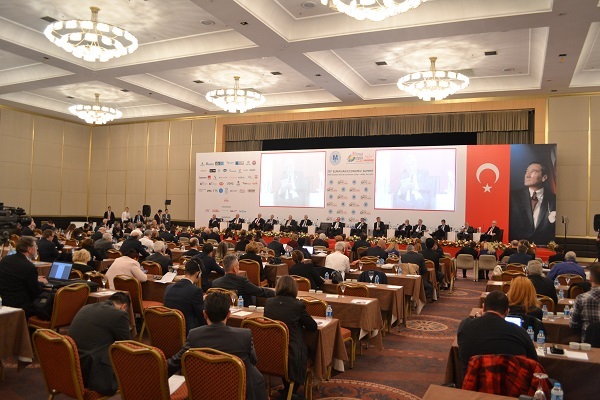 Mladen Ivanic, the Chairman of the Presidency and the Turkish Republic of Northern Cyprus by H.E. Mustafa Akıncı, the President, Moldova - Gagauzia by H.E. Irina Vlah, Governor of Autonomous Territorial Unit. 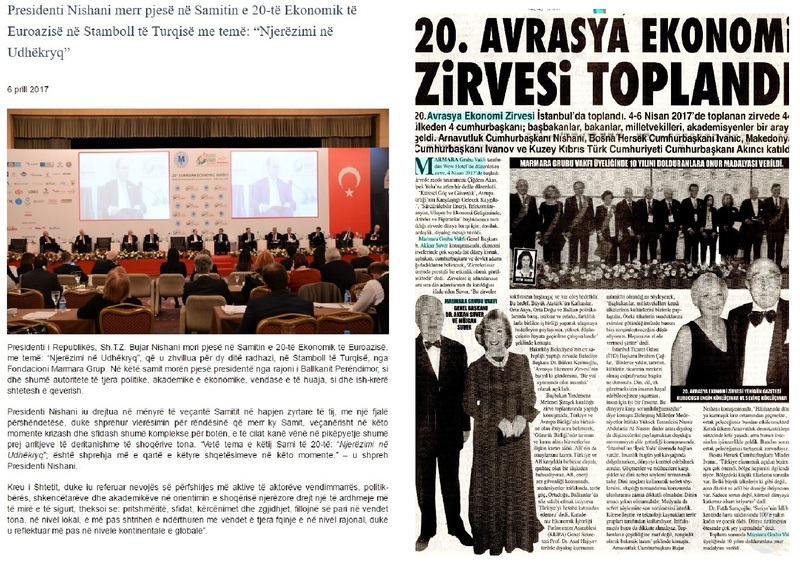 Together with this, Former Prime Ministers of 2 countries were present during the Summit; H.E. Victor Ponta, FRM Prime Minister of Romania - H.E. Alenka Bratusek, FRM Prime Minister of Slovenia. 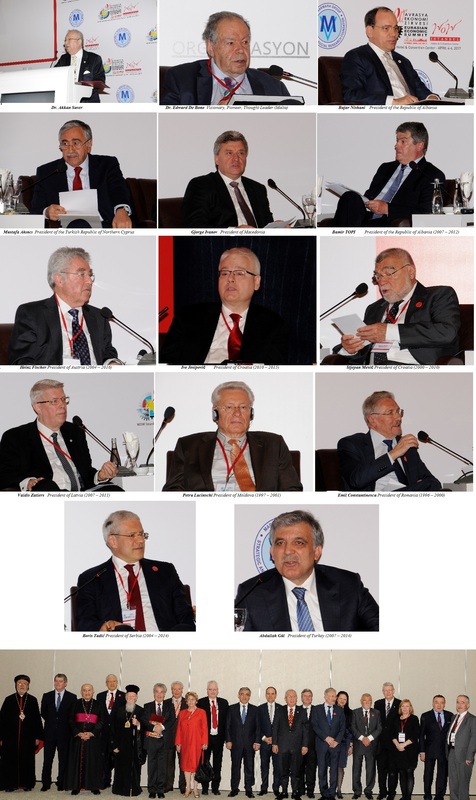 Former Presidents of 7 countries such as H.E. Bamir Topi from Albania, H.E. Valdis Zatlers from Latvia, H.E. Stjepan Mesic and H.E. Ivo Josipovic from Croatia, H.E. Petru Lucinschi from Moldova, H.E. Emil Constantinescu from Romania, H.E. Boris Tadic from Serbia and H.E. Heinz Fischer from Austria also attended and addressed at the sessions. 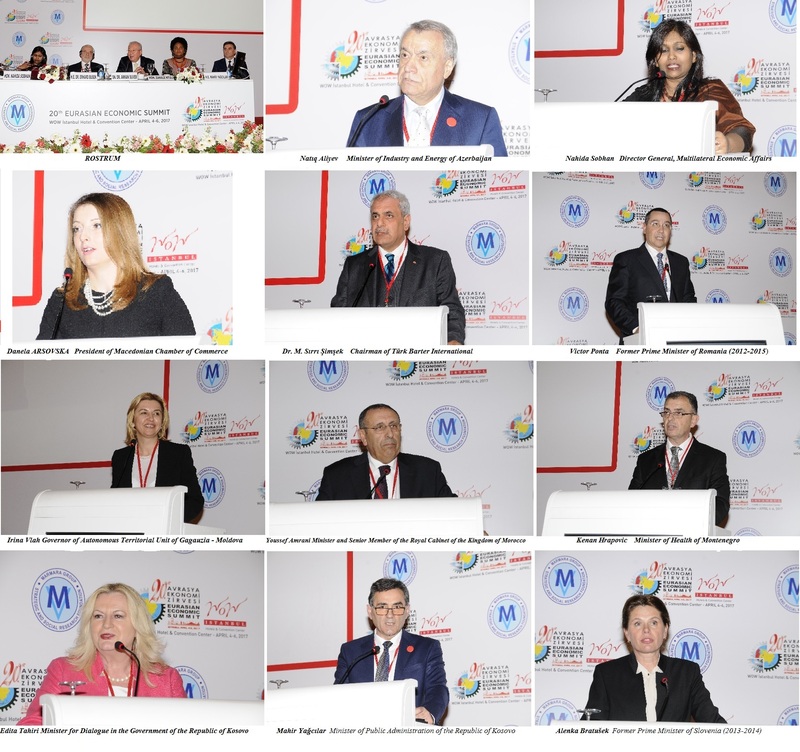 This year, the 20th Eurasian Economic Summit gathered almost 323 guests including ministers, former ministers, ambassadors, businesswomen, businessmen, academicians and religious functionaries. 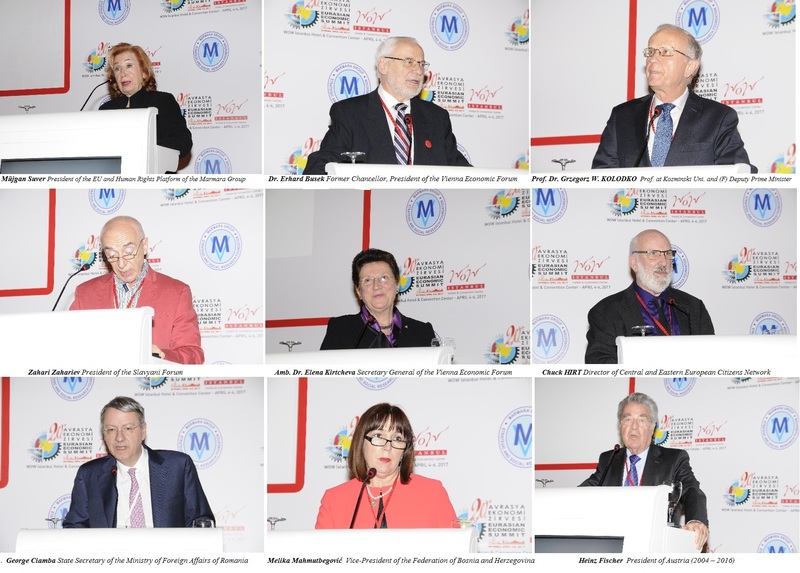 It is decided that the results which were gained during the 20th Eurasian Economic Summit which focused on the issues of "The Future of European Union", " Sustainable Energy", "The Refugee Problem", "Rising Nationalism and Populism", “Neoliberal Economy and Global Terror", will be shared to whole humanity with consulting to high sensitiveness of United Nations. When we observe the socio-politic developments which affect the whole world at the present time, the question “Is humanity at a crossroads?" is coming to our mind in particular. Rising nationalism, populism, refugee influxes, the external interferences to Middle East with the aim of reaching at the energy resources and the fluctuations in the market because of these interferences, violence, poverty, discrimination and politic oppression have become the significant problems of the time. Societies are living under the risks of thread, diffusing, and losing their identity. Leaders are going towards populism without thinking about their responsibilities and humanitarian values. Rising of these radical movements have been causing the increase of both non-state, non-governmental actors and the worries regarding the future. This global view is showing us that we have not learnt lessons from the history sufficiently. Our world must have come to this point because we did not take our responsibilities and we neglected our duties. For instance, global organizations such as European Union and United Nations, of which we admitted the importance and value, could not manage to transform themselves the organizations which fit the changing conditions of the world. Falling back upon preservative precautions in economy ruined the current structures. Appealing to populism, which looks like an "easy solution" under difficult situations, poses danger more. It is forgotten that the thoughts and policies like populism, racism and discrimination does not bring happiness and welfare to the societies. Whole world have faced with the problems because of this reason and so forth. We have to interrogate that if Europe which is under the thread of deterioration due to the nationalism waves, the East-West, Christian-Muslim polarizations in world policies, the policy which is being sustained with emphasizing the perceptions of enemies over the ethnic and religious identities, will cause The Third World War. There would be nothing to do if the cases transforms to wars. The decisions that we make now will play a critical role in the faith of world and humanity. Humanity is at a crossroads.. Maybe we are in the last stop, maybe we have one more chance that we have not used yet. The crisis which European Union is facing with, weakening the essential principles from the establishment. It is need a powerful and democratic Europe for stability and enhancement. Member countries have not succeeded to make common decisions and they have been away from the institutional principles. When every country attempts to solve their own problems with their traditional way in Europe where the new policies, new ideas, new vision and strategies are not found out, the arising of Islamophobia and populism have become inevitable. In the face of refugee waves, the borders have been closed down, the walls have been put against the pains. At this point, although the current consensus formula in Europe is " staying together but in different velocities" and " multi-speed Europe", Eastern Europe countries are putting forward the judgments "this situation may lead different classes of membership" and " 3-4 countries are making decision on behalf of whole Europe". These worries are questioning the sustainability of current consensus formula. Unexpected developments in world indicates that the integration of Europe needs to be continue for the safety of this region and for the peace. There is an urgent need of institutional reforms in this field. Europe should prioritize the self-rules of market instead of protectionism which is contrary to their own principles. There should be a European Union ethic as part of economic and military projects. It is need to be aimed for a construction of Europe that respects cultural and ethnic identities. It is time for a new social contract in order to prohibit Turkey and Balkans, who see themselves as European, from returning to their previous histories. European Union should identify itself as "Europe" with these countries. World needs to interiorize the refugee matter. It is inevitable that extraordinary problems result in surprising consequences. The war in Syria led Europe have a migration problem. Turkey and European Union was exposed to a huge refugee wave. If new solutions and policies with a new point of view are not formed, this problem will cause more damages. The problem of migration and refugee should be handled with the economic, politic and environmental reasons. European Unions' sustaining its presence as global role within a consensus depends on its' attitude on these crisis. Due to the fact that annihilating the crisis of migration and refugee depends on annihilating the reasons, Europe needs to generate fast and correct forms of solutions which reveal the global power and prestige of Europe. 21st century caused a new terror problem for humanity. We are facing with a global terror which is different from the terror acts in past. We find the defining of global terror as “Clash of Civilization" wrong. Wrong and deficient definitions are affecting the fight against terror negatively. The fight against the terrorism, can be managed by annihilating the reasons of terrorism. The military interventions may not be enough in order to get some results. The main reasons of terror are economy, the wrong policies that is followed in order to capture the energy resources and the strong ones' ambitions of re-drawing the maps in accordance with their own profits. Economy became a one and it became global. But, every country sustains their own traditional policies which prioritize their own economic profits. "Peace" policy should be followed instead of national economic profits. It should be insistent for interviews for the acceptable solutions against economic profit conflicts. We need to form a global awareness in order to manage it. The matter is that Capitalism needs radical reform. It is clear that neo-liberalism is sliding the world into crisis as both in terms of economy and in terms of socio-culture. This ideology has to vanish. However, we should not let nationalism fill neo-liberalism's place. In that case, it will lead to a worse disaster. The global awareness of this issue will strengthen the fight against global terror. We are making a call for sustaining the democratic standards, engaging the new law structures and implementing common sanctions against the countries which support the terrorism, in the fight against terrorism. The fight against the global terrorism places significant responsibilities to the religious institutions and organizations as well. Within this context, we care deeply for H.E. İlham Aliyev, President of Azerbaijan to declare the year 2017 as the year of Islamic Solidarity. Religion is necessary as it provides serenity, inner calmness. It is misleading to look for the solutions of the problems only in religion. Basing the whole the success and hope on religion is the same as laying the whole of the sin upon religion.The problem is not with the religion, but is with people. The problem is with us. We could not be aware enough the disaster it will cause to put the religion within the politics. Religious values were the ones that had suffered the greatest damage. Religion is unifying, politics is discriminating. We defend the fact that religious organizations need to stay in a civil area, out of the legal area. 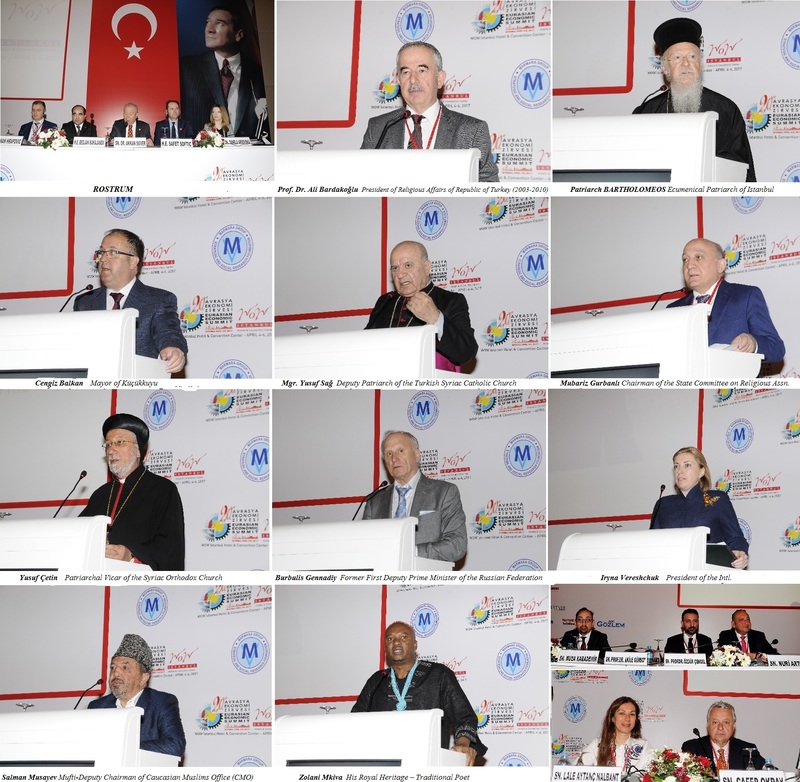 The principles that guide us in applying available human rights are to a large extend, by means of our background that we have provided from the attitude of the world religions towards the human rights. We know that both religions and human rights protect the human honor. We want dialogue between religions against terrorism. We find it false to associate Islam with terrorism in the fight against terrorism. For the world peace and serenity, we find compulsory for the religions talk in a common language. We want reorganization in the United Nations. We find it inevitable. There are 5 members in the UN Security Council; their works are based on the model of compatibility of their interests. When they do not get along with each other, people and humanity compensate for the damages. The world is going towards a different direction that none of us want. Hence, we believe that countries need to act by taking a common initiative. UN must be the guardian of the global justice. We want it to be an institution that eliminates the distinction of small-big state, works for the common stability and welfare, establishes rules, relieves the pains of war and genocide. We want and wait for the action to be immediately taken for a UN that the humanity hopes seeks the permanent peace and justice, the necessary institutional reforms to be made for the transition.